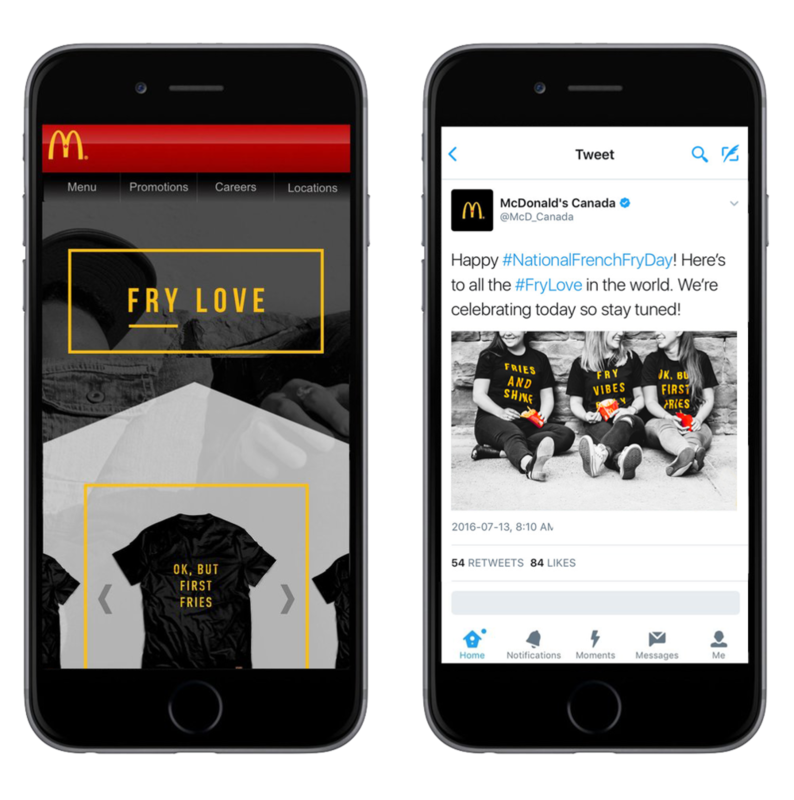 I developed strategies and content for McDonald’s social media accounts by using an approach that ensured everything we produced was on-brand and made efficiently, resulting in a maximum ROI. I conceptualized, art directed, styled, photographed, and edited social posts and digital content for the brand. I developed strategies and content for McDonald’s social media accounts ensuring everything we produced was on-brand and made efficiently, resulting in a maximum ROI. I conceptualized, art directed, styled, photographed, and edited social posts and digital content for the brand. To celebrate #NationalFrenchFryDay, we developed a social campaign to help McDonald's own the holiday. We worked with influencers and gave away free t-shirts, resulting in 9 million impressions and 2000 claimed shirts in under 2 hours. I strategized, as well as photographed and edited the campaign imagery. I produced McDonalds content throughout the seasons, creating self-styled animated GIFs and photos. My work successfully increased brand sentiment and was used for evergreen posts, social holidays, and promotional giveaways. Leading up to McCafé’s coffee giveaway, we developed content for "Coffee O'Clock", a campaign celebrating the times and ways in which coffee can be enjoyed. I conceptualized, planned, photographed and edited the series of images.